Ro and I are not into celebrating Valentines day as such. But that didn’t stop me from making elaborate cakes (picture sponge cakes iced with fresh cream and strawberries) in the past. This Valentines day and the next few days are going to be different. We are looking forward to spending some quality time together. Our first born will join us in a few weeks from now. Life is going to change forever. There is going to be added responsibility and gone will be those carefree days and years when we did whatever we wished and willed. There is much uncertainty, but we are looking forward to it with excitement and joy. 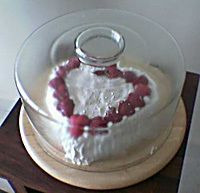 Coming back to Valentines day, this time I thought of baking something healthier, nice and less time consuming than the elaborate and lavishly iced cakes. My mind wandered to a recipe given by someone, scribbled carelessly in my notebook. I was craving a cake with deep rich flavours and decided to give this recipe a go. Grease and line the bottom of an 8” square or 9” round cake tin with greaseproof paper/baking parchment/butter paper. In a mixing bowl, assemble the flour, baking powder and baking soda, mix with a spoon and sieve once to make the mixture uniform. 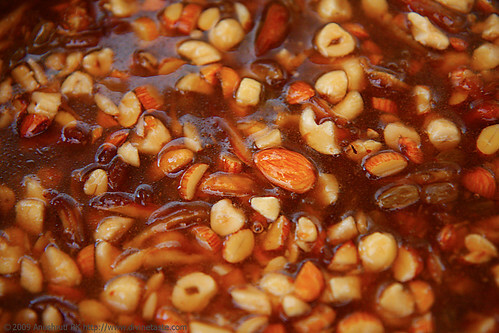 Heat the oil in a pan and add the fruits and nuts. Stir in the jaggery, sugar, jam and 100 ml water. Heat on a low flame until the sugar and jaggery melt, stirring all the while. Don’t overcook the mixture. Allow to cool and add the reamaining 100 ml water, rind and spice powder. Mix in the sifted flour mixture and beat with a spoon or a wire whisk until there are no lumps. Transfer the contents to the greased and lined tin and bake in a preheated oven at 150 degree centigrade for 1 hour or until a skewer comes out clean. A totally different question, but a relevant one as well. Connected to the recipe. Its about the medium of baking. Microwaves have the grill facility as well. It works as an oven in some models, they say. What's your opinion on this? There is much debate on the harmful effects of microwave. Goes without saying, yum pics and how long for a piece of that cake, sitting pretty! Simi: I dont use a microwave oven and am against the use of one. The effects are a debatable issue, but I believe that when in doubt to avoid, if it can be avoided. I have baked a cake in a microwave oven, eons ago when I briefly used one. In my opinion, a conventional oven works best for baking. what are the contents of the 'spice powder' you've mentioned? and Anu, i can only imagine healthy food coming from your kitchen for the li'l one on the way! Preethi: The ingredients for the spice powder were mentioned in the glossary. There are some hurdles that need to be sorted out with the glossary which should happen soon. In the meanwhile this what I used for the spice powder. Grind everything together in a spice grinder or a coffee mill. I also used ginger powder in this mixture, but found it to be a bit overpowering over the subtle flavours of the other spices and I doubt I'm going to be using ginger powder again. Congrats Anushruti !! 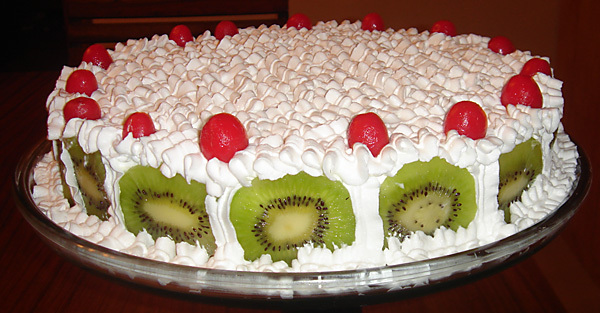 Love fruits cakes.. one of my fav cakes. Lovely pics as usual. Hi i guess u dont know me…found this site via the search engine. I learn your carrying, plz advise a suitable diet for pregant women, as my sister is carrying, 4 months. Welcome to divinetaste. Yes, I'm expecting and due anytime now. Pregnancy is a time when one definitely needs to pay extra attention to one's diet as the health of both the mother and the tiny life within her are at stake. A good nutritious diet will ensure the health and well-being of both the mother and child. Studies have shown that a proper diet during pregnancy results in a healthy child at birth and also helps tackle pregnancy problems like nausea, water retention, weight problems, constipation etc. Having said that, there is a whole array of information and a list of do's and dont's in the form of internet, books and "well-meaning" people around. It can get confusing and daunting to the mother. What works for one may not necessarily work for another. I followed a lacto-vegetarian diet throughout my pregnancy. It was regular food for me but I made sure I got my required proteins, vitamins, minerals and carbohydrates through my diet. I ate (eat!) plenty of fruits, vegetables, legumes, nuts, greens, etc. Soaked almonds, raisins, turmeric milk with 4 to 5 strands of ground saffron (after 3 months), sprouts, buttermilk in the day time complement a pregnancy diet. Hope this helps. If you have any further questions, you can mail me or ask here. All the very best to you sister. Hey Anushruti, you mentioned fruit jam in the above recipe. Is it mixed fruit jam or something else? Smita: Any mixed fruit jam would do. I was wondering if I could use whole wheat pastry flour instead of APF..
Geetha: Yes you could use whole wheat pastry flour instead of APF. I am a regular visitor to your website.And, I just love it! 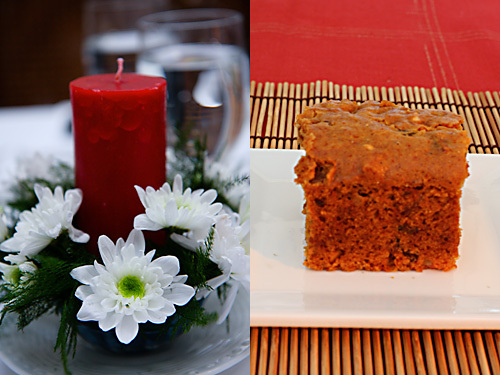 I am planning to make Eggless Fruit and Nut cake for my mom's birthday next week! I noticed that you have Fruit jam without added sugar as one of the ingredients. Can I make it without the jam? Is there a substitute? Can you post measurement in cups? like how do I measure 200 gm jaggery? Rupa: The jam adds flavour but you could try making it without it. Tejas: Metric measurements always give accurate results, especially in baking. Will try and post measurements in cups soon. 150 gm is approx 3/4 cup jaggery I presume. Planning to bake this cake this weekend. You never mentioned how the cake tasted..Whats the verdict? Is the taste of jageery overpowering? Can I use light brown sugar instead of jaggery. Priya: You could use brown sugar if you wish, but jaggery gives the deep flavours of dark muscovado sugar. and no, the taste of jaggery is not overpowering, Infact it complements this cake. Oh dear…why didnt it work? Try some of the other cake recipes here starting with the basic ones. There are many people who have had success baking this cake though! Tried this with wheat flour, was yummy. thank you. hi Anushruti, happy to have found your website! I love ayurvedic cooking and looking forward to trying your recipes! I am going to send this recipe to my mom in RUssia:) Funny how internet connects people all over the world. Your Indian recipe made it to New York and then to the South of Russia in just minutes:). Cheers! Nadya: Hello Nadya! The power of the internet is immense isnt it? Thanks for writing and I hope you enjoy my recipes! Diwali wishes to you and your family! Would like to try this cake today. Can the oil be replaced with butter here for richer taste? My family somehow enjoys cakes made with butter more than the ones made with oil. I made this cake following the exact recipe. The taste was good but my cake sank in the middle. I checked the FAQ's but could not figure out as I followed it to the tee. Forgot to mention the cake tasted awesome. Except for the middle sinking part and should it be cooled completely before cutting. Sorry for the basic questions I am new to baking. Truly this is one of the best cakes I have ever eaten. Awesome! great cake. I tried it out and it came out very well. I am wondering if you have any tips for basic icing on cakes. Hi,made this cake today.The experience of baking it was nice,i was trying a fruit cake for the first time,however there were a few things that didn't go my way. 1)The cake was too sweet,though i used half the mentioned amount of sugar (I thought of decreasing the sugar as i was using raisins,apricots,figs and dates,together 250 gm)..
3) The cake sank in the middle. Would like to know from you if you can figure out what could have gone wrong. I used a kitchen scale for all the measurements. Also 4)it wasn't crumbly,it was soft as if it wasn't cooked! Ashwini: The amount of sweetness is very subjective and this recipe uses equal amount of flour to sugar i.e 300 gm flour and 300 gm sweetener and the cake is sweet but not overtly sweet. Looks like you used too much liquid so your cake was soft and sank in the middle which should not happen and would not have happened if the correct amount of liquid is used. 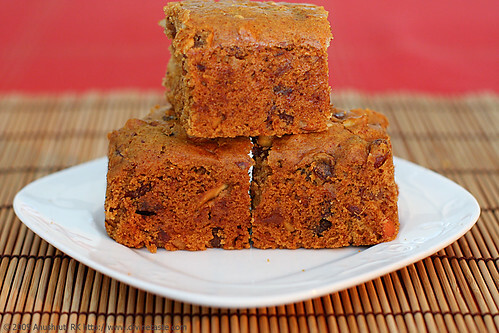 A lot of people love this recipe ( http://www.divyascookbook.com/2009/12/eggless-fruit-and-nut-cake.html ) and I'm sorry you faced these problems with it. Thank you for pointing out,i loved the taste of the cake but for the problems i mentioned. I am sure there must have been some mistake on my part. Thank you.wishing u a merry x'mas and a happy new year. Can you please post this recipe with measurements in cups please? Thank you Ashwini. Wish you the same. 3) Also it overflowed from my 9 inch round pan. Like I said it tasted real good…so all's well that tastes well. But is there something wrong I did here? just a quick question, do you use tutti frutti in your cake? I mean is it allowed for vegetarian. shilpa: Tutti frutti is vegetarian but I don't use it because of the harsh colours used. Hi Anushruti..I'm quite new to baking..gave this cake as well as your chocolate cake and the banana chocolate chip bread a try..the previous two turned out very yummy n disappeared in no time..thank u for the lovely recipes..however this cake felt soft in the centre after an hr of baking so I baked it till the tester came out clean..i.e 1/2 an hr more..had followed it to the tee..even the cake tin size ,measurements etc..but this cake sank..it feels gooey..even the previous cakes sank in the centre but were tasty..am using national OTG ..thank you again for your recipes again..
Hi Anushruti ..u may find my posts under a couple of more recipes..as I mentioned am new to ur website n also to baking..wanted to clarify my doubts about baking..hope u don't mind..am using national otg in which the upper n lower grills heat alternatively..I place my baking tins(for cakes) or trays(for cookies n biscuits) in the centre rack..hubby dear is going to oblige me or himself !!!! wid a new oven,maybe Murphy Richard soon..until then please do let me know how do I improvise my baking..the major problem being my cakes sinking in the centre..I do a double check on all the measurements specified in the recipe..don't add excess liquid..also my soda bicarbonate is old but active..hope u don't mind my long post..will be very glad to get ur feedback coz ur recipes have surely got me delighted to bake as I ised to dread it ..
Pooja- Please refer to my baking FAQ. A cake sinks in the oven if the oven door is opened before the baking time is complete, the temperature is uneven or if the tin size is not right. Pooja- Glad to know about your interest in my recipes. Have answered you query above. Hope it helps, and good luck with your baking! Hello, wanted to check if this cake will stay good for a week. My husband is traveling for a week and want to pack something that won’t go bad during travel . Suggestions for the same would be great! Saranya- I think it will if put in an air tight container. Do you have any info about cake improver/gel/emulsifier? These are being used nowadays by many housewives to make their cakes extremely light fluffy ligh store-bought one. It is used by bakeries especially in eggless pastries/cakes. Have you ever used it? Mina: I did use it once, but dont feel the need to use it anymore on a regular basis.